Enjoy the Amalfi Coast on a private boat. Your captain will help you discover the natural beauty of the coast as its meant to be seen...from the sea! We will pick you up at your nearest embarkation point and head along the coastline with the day tailored to your personal requests. You can relax on the sundeck, stop to swim at the best spots, and enjoy local snacks and beverages provided on board. Each tour is customised based upon your interests and needs. Following are some options. Experience a dream day discovering the island of Capri. Your captain will be at your disposal and take you on a memorable journey , Circumnavigate it , swim in the best little spots, see the enchanting grottoes, stop to enjoy lunch at a very good seaside restaurant and explore the center with all its luxury boutique. For those wishing to experience the most delightful and romantic time of sunset falling over Capri and the Amalfi Coast unique skyline, or to celebrate a special occasion or romantic evening. Enjoy unique views and a relaxing environment on board your private boat for the evening , just for you and your chosen companions, loved ones, family or friends. 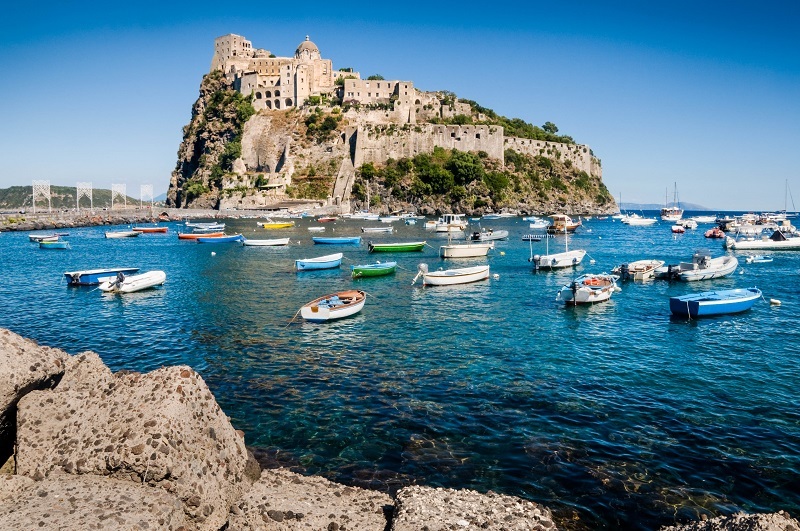 Visit with us the island of Ischia, known for its magical health spa's and thermal waters. Take chance to swim in the natural hot volcanic waters , enjoy its green coast and discover alluring beaches. Stop for a overnight if you wish and visit the major attractions of the place: The Aragonese Castle, Sant'Angelo, the gardens of Mortella or enjoy a luxury day-spa upon request. Enjoy a cruise along the coastline of Sorrento,made of hidden creeks, small bays, rocks and beaches. Stop for a relaxing swim in the clear waters of Regina Giovanna. The journey will continue through the island of Vivara and finaly Procida, the smallest of the Gulf of Naples islands. Often overshadowed by Capri and Ischia, Procida offers colourful and picturesque villages, stunning views of the sea and the natural forms of the island, Also interesting history and delicious food. .. If you are looking to live a dream day with a sense of old glam , choose to sail along the stunning Amalfi Coast on board a gozzo, typical wooden boat from the area. Enjoy a seaside afternoon just like Jaqueline Kennedy did on her Amalfi Coast holiday in the summer of 1962 . Stop for a swim in Conca dei Marini and visit Amalfi and Ravello on board the same car she used . Sleep aboard for an unsual and unique accommodation experience. This is a special package that includes overnight on board our luxury Rizzardi CR 50 TopLine in the port of Amalfi and a tour to Capri the following day. Sleep and listening to the gentle waves in a pure five star comfort. Enjoy breakfast on the deck with a spectacular view over the port and start a day like no other.